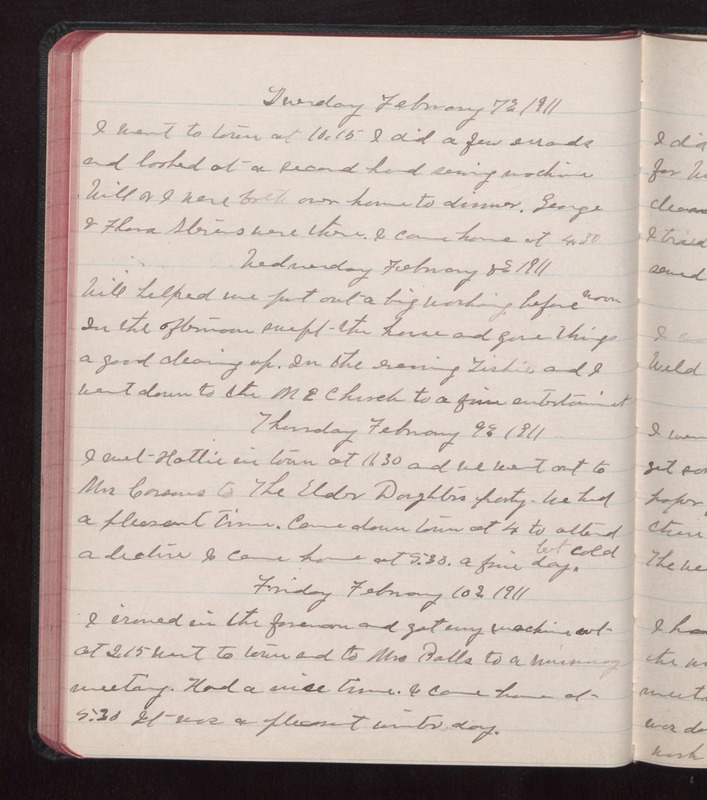 Tuesday February 7 1911 I went to town at 10.15 I did a few errands and looked at a [illegible] [illegible] sewing machine Will & I were both over home to dinner. George & Flora Stevens were there. I came home at 4.30 Wednesday February 8 1911 Will helped me put out a big washing before noon In the ofternoon swept the house and gave things a good cleaning up. In the evening Tishie and I went down to the ME Church to a fine entertainment Thursday February 9 1911 I met Hattie in town at 11.30 and we went out to Mrs [Carsons?] to the Elder Daughters party. We had a pleasant time. Came down town at 4 to attend a [lecture?] I came home at 5.30. A fine day but cold. Friday february 10 1911 I ironed in the forenoon and got my machine out at 2.15 went to town and to Mrs Balls to a [missionary?] meeting. Had a nice time. I came home at 5.30 It was a pleasant winter day.